Hey everyone! So, I have another sneak peak from Let Them Eat Vegan for you. These are my Banana-Scented Cupcakes with Cooked Chocolate Frosting. 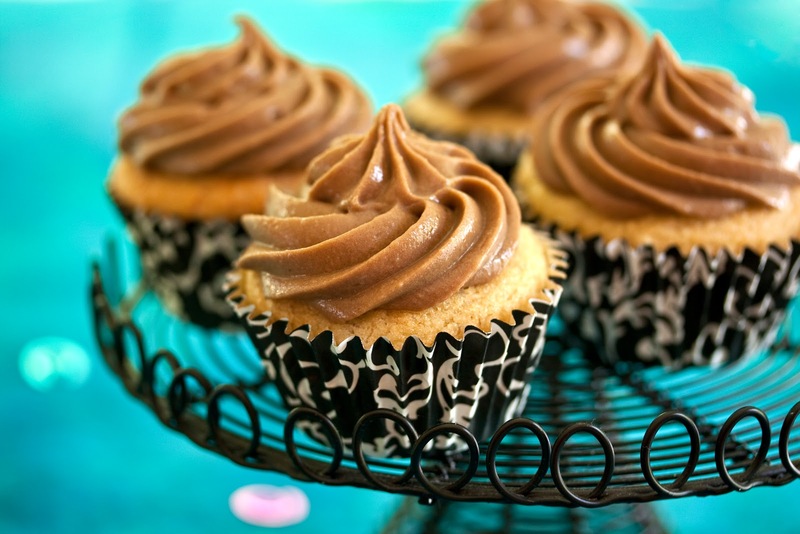 Both cupcakes and frosting are gluten-free and soy-free (as long as you choose a soy-free milk). And both are fantastically delicious! The frosting is one of my new favorites. Since it is based on a cooked technique, it has less sugar and fat than a buttercream frosting. Just sweet enough and lusciously creamy! Hannah made these look so pretty for me! I love this photo, the background, the serving tray, the liners - everything. And, I'm counting on the fact that this gorgeous photo will bring you back for a second look. You see, our lives are so ridiculously busy right now that I'm trying to buy some time with you before my next post. Haha! I'll explain soon, but for now, take my word. I'm frenzied. If you see me running around town looking like I'm on some frenetic mission, well I am. Trying to accomplish many tasks before December, including preparing for Christmas. So, bear with me if my posts are a little sporadic in the coming weeks. Just come back and look at the cupcakes already! They're pretty enough for seconds, or thirds, right?! Dreena.. Those cupcakes look fantastic! In fact, I'd wager that they're the best gluten free cupcakes I've ever seen. Can't wait for the recipe. Stay sane and hang in there! I WIL come back to look at these cupcakes! Ooh, those look so pretty! I am really excited that Hannah is doing your book photography, she is one talented young lady! I haven't tried the cooked frosting but the texture looks incredible, may have to re-visit the tester site to look for the recipe! I have those same cupcake liners. I love them. They are so pretty and the cupcakes always come out of the liners so nicely.